Zugegeben: bis auf die kleinen Pseudo-Edelsteinchen habe ich mich auf Glitter konzentriert – aber da auch keine halben Sachen gemacht. Bis auf den Schneemann glittert hier alles! 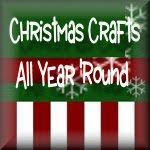 I admit: other than the tiny rhinestones I focused on glitter – I went the whole nine yards so to speak. Everything other than the snowman is pure glitter! Und ja, da sind sie wieder, die Keksrand-Kreise… Wenn ich mich einmal an einer Sache festbeiße! And yes, here we go again; scalloped circles… I can’t let go. 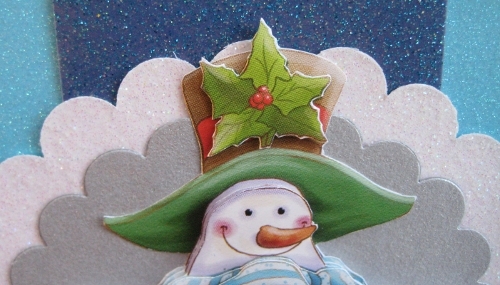 What a super sparkly card this is … And a happy snowman too! Loving those scalloped circles! Love the glittery sparkle … and the dimension on your image is fantastic … so very glad you joined us at jingle belles. Ooh, what a pretty card you made! 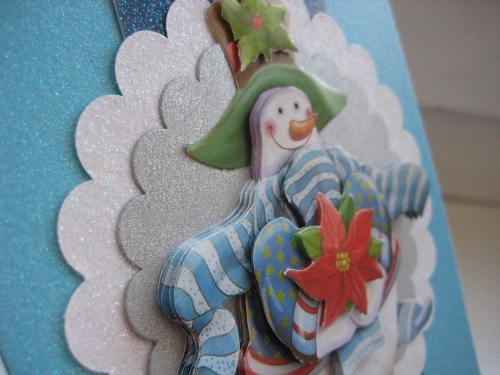 what a lovely combination of glitter papers and they look wonderful glitter paper too – what make are they? 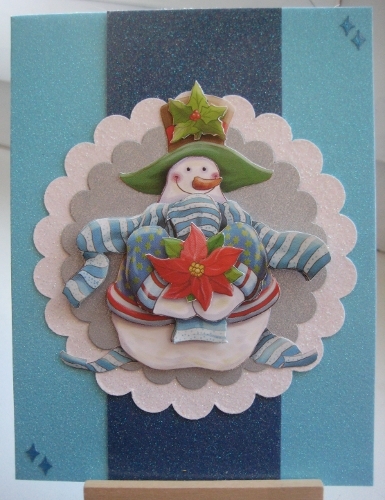 great card and the snowman dimension is such fun! Thanks so much for joining in on my prompt over at Jingle Belles 🙂 !! 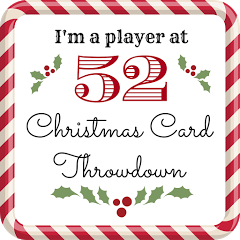 The card is from the WINTER Box of Cards from Provo / DCWC. But the box is at least three years old. The dark blue glitter paper down the middle is from the Glitter Cardstock Border Stack, also from DCWC. Bought in Boston last summer so it might still be available. The white scalloped circle is from K&Company… but also a couple of years old. I can’t give you any info on the silver scalloped circle – I know I bought the paper in Germany but I have no info on the make anymore.